Hi great to see you! It's definitely starting to feel a bit like fall out there the wind is a bit cooler than it has been. I sure have been enjoying these last few days of great weather though. Last night we got our first frost, yikes. I sure hope that fall is long and warm and none of that white stuff for a while. This is a card that I made using a Miss Rach digi called Baby Moose. Super cute and great for a guy card, those seem to be a bit harder to make, without sticking girly things on them like flowers. This one is a perfect image for that. 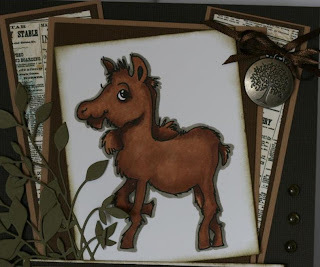 You can hope over to the Whimsy Stamps store to check out this and other great images. 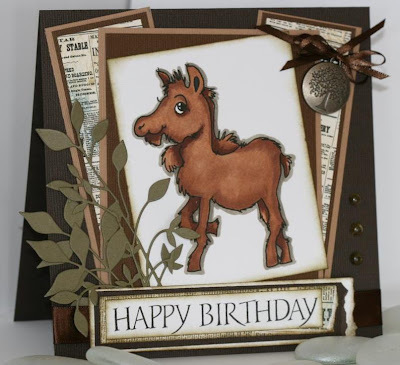 Click here to jump over to the Whimsy Challenge blog to get daily inspiration on great projects and cards made with wonderful Whimsy images. This is my inspirational card for today. Supplies: Copic markers, Bazzill cardstock, Prima patterened paper, Hero arts sentiment, MB Fresh Foliage die cut, Moments metal embellishment, Robin's nest clear gems, Offray ribbon. Nicely done, love the colors and the image is cool! Wonderful card - fabulous LO. Great card! Love the way you put the design together! Thank you for coloring along with us at Chocolate, Coffee and Cards.